Fall, in many real estate markets, is a slow season for buying and selling homes. Prepare your house for sell can really pays off in terms of faster, more profitable sales. There are simple and effective ways to prepare homes for sale in every budget category. 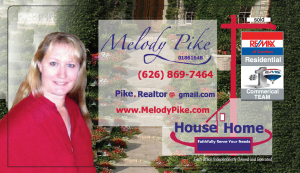 If you would like to consider your options for selling your home, investment property please contact Melody Pike Southern California Realtor who works in both residential houses and commercial apartment complexes. Realtor serving Orange, Los Angeles, San Bernardino and Riverside counties.